It can be difficult to understand which “authorities” to trust when you are trying to become healthy. Some sources state one type of food is excellent for your health; another site might tell you that the same food is hazardous and can cause health issues. So, who should you trust? Sticking to a healthy diet is hard enough as it is, but it can be even more challenging because of the misinformation that is often posted on the internet. Keep reading as we show you what food myths are detrimental to your health. Some of these might surprise you! ● Products claiming to be “fat-free” or “low-fat” are trying to tell consumers that eating them will not make you fat. In reality, healthy fats are critical for a healthy diet. In the past, studies have suggested that eating less fat was essential for improving health and losing weight. This sparked many companies marketing this option and people believing that it was the best way to eat. In reality, foods that are processed to become artificially fat-free or low-fat are often less healthy than full-fat options. This is because they are stuffed with fillers, chemicals and sugar to substitute for the missing fat. Fat is not the enemy, and using healthy fats in your diet is critical for your overall health. ● Contrary to popular belief, eggs are not bad for you. A trend has been to eat egg whites only, but egg whites on their own are less beneficial for your health than the egg as a whole. The yolk is where the majority of the egg’s nutritional value comes from. 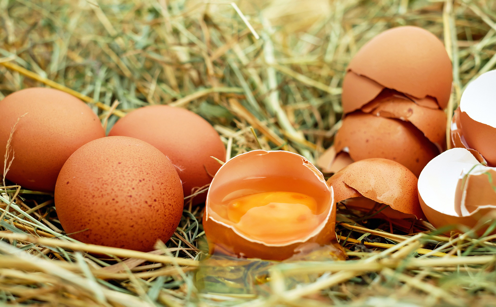 Recent studies have stated that an egg will not increase your risk for heart disease like previously thought. Eggs are also an excellent source of protein. Eggs from free-range chickens who forage for food are the most nutritionally-rich. ● Not only will artificial sweeteners not help you lose weight, but they cause you to gain more weight than before. Typically, sweetening products increase your appetite and even make you crave more sugar and junk food. Additionally, it is believed that these sweeteners have several negative side effects, and can alter the way your body regulates your metabolism. Some people have even had severe health problems from consuming artificial sweeteners. ● Many people believe that when you eat calories at night, they can become more fattening than those eaten early in the day. This is not true. Calories are calories, and it does not matter what time you eat them. What matters are the quality of those calories you intake; nutrient-dense foods are the most beneficial to your health. Foods that spike your blood sugar levels are detrimental when eaten any time during the day. That includes sugar-laden foods, beverages, and processed foods; all of these should be eaten minimally. Although there are great articles and well-researched sources online, it cannot all be trusted, so make sure that you do your research carefully before starting any health plan. Being thorough about your research from trusted sources is imperative. As you read more and more, you will find that common threads emerge that you can follow to successfully guide you in your journey to good health.